Why Is My Dog’s Stomach Itchy, Dry, Irritated, and Red? There are several reasons why your dog may be scratching at his or her stomach. First you will need to take a close look at your dog’s stomach; what you see will help determine the cause of the itch. 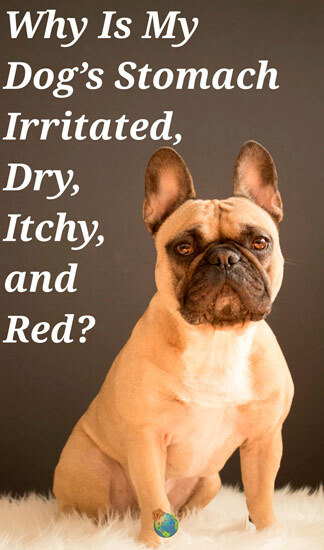 Each of the above listed scenarios will require unique steps to resolve your dog’s itching. -Fleas: The quickest way to resolve a flea problem is to give your dog a bath with a specific shampoo that kills fleas. Resist the urge to pick the fleas from your dog’s coat/skin. Picking the fleas one by one will not rid all of the fleas from your dog’s coat and it may further agitate your dog since he/she has already been picked at by the fleas! Fleas feed on your dog by biting through the skin and sucking blood. After you bathe your dog, give enough time for the coat to dry. Check again for any fleas that may have survived the wash. If you see more fleas follow the directions on the bottle and give your dog another bath. Many shampoos require you to let the suds sit for a few minutes while the medicine penetrates the fur and kills the fleas. This should rid your dog of all fleas. If you do not see any fleas do not use flea shampoo. Flea shampoo can actually worsen a rash if the irritation is due to another cause. Flea medicine is a good idea if your dog goes outside or is exposed to other dogs or animals. Most flea medicines are administered once a month and resolve flea problems the best. -Tick: If you see a tick, prepare to remove it. It is possible for your dog to have a tick even if you can’t see it. Ticks like to burrow themselves under a dog’s skin. If the tick is burrowed it is best to go to the vet to have it professionally removed since a scalpel may be involved. To remove the tick on your own, the following tools should be used for a safe and clean removal: gloves, tweezers, and an antiseptic (rubbing alcohol/hydrogen peroxide are most common). Antiseptics reduce the risk of infection and help sterilize the area. While wearing the gloves, grab as much as you can of the tick with the tweezers and pull straight out. Be sure not to dig at or pinch your dog’s skin which can cause further irritation. Once you remove the tick, it’s a good idea to kill it with the alcohol. Clean the area of your dog’s skin where the tick was attached with the alcohol. Keep an eye on your dog’s behavior for the next week. Ticks can cause illness, which include symptoms like fatigue, loss of appetite, and swollen joints. If you see your dog having any of these symptoms, seek veterinarian attention. -A rash/red bumps: Several irritants could cause a rash. Your dog may be having a food allergy, an environmental allergy, an infection, or mites. You will be able to tell if the type of rash your dog has is itchy or painful by watching your dog’s actions. Excessive scratching, licking of the paws, shaking of the head, biting of the paws/tail, and rubbing up against objects all indicate an itchy rash. You can either have your dog tested for food allergies or you could put your dog on a strict diet to eliminate allergenic foods. Some dogs can be allergic to beef, soy, dairy, fish, chicken, wheat, corn, eggs, or yeast. Unfortunately all of these foods are common in dog food. You will want to start an elimination diet for your dog, which means feeding him or her new foods that they have never had before and eliminating all food they normally eat. If your dog eats a variety of foods and you don’t think you will be able to pinpoint specific allergens then eliminate all foods and slowly introduce each food back into your dog’s diet week by week. This will take time but it will give you a greater chance of finding a solution for your dog. One week try only sweet potatoes, the next week try sweet potatoes and chicken, the next week try sweet potatoes, chicken, and rice..and so on. If your dog’s rash clears up or comes back, you will be able to tell which food your dog is allergic to. Environmental allergies include grass, dust, weeds, and mold, which are all very similar to human allergies. You will want to get your dog tested for allergies since it is difficult to control and isolate these allergens while trying to pinpoint your dog’s troubles. Your dog may be put on an allergy medicine or benadryl, which will reduce swelling and irritation. 1 mg of Bendryl per pound can be given. A skin infection is easier to pinpoint. Skin infections are usually red, bumpy, and often a secretion is present. You can give your dog a bath with an antibacterial shampoo to help clean and clear up the infection. If you suspect your dog may have mites then you will want to bring your dog in to the Vet. This is the only effective way to eliminate the possibility of skin mites and receive proper treatment. 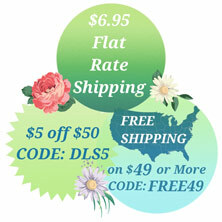 -Dry skin: Dry skin may be due to living in a low moisture region (think New England during the Winter). Many feel the urge to give their dog a bath when they see dry skin or dandruff but giving your dog a bath will actually dry out your dog’s skin even more. You will want to apply some hydrocortisone cream which will reduce the urge to scratch. Also, you will want to make sure your dog’s food has essential omega oils and fatty acids. Having these oils in your dog’s diet is essential to maintaining a healthy coat and skin. Moisturizing sprays are also available which contain natural oatmeal, fatty acids, and glycerin, all of which sooth skin and provide moisture. Running a humidifier in the house where your dog generally stays is a good idea to raise the moisture levels in the air. This will also help re-moisturize their coat. -Scabs/Blood: Determine the cause of the blood or the blood that has dried and turned into a scab. Clean the area well with hydrogen peroxide. Some like to use a 50/50 mix of warm water and peroxide so the sting isn’t too much for the dog. Make sure the cut or scab does not look infected. Infected areas or deep cuts should be treated at the Vet. You should also take your dog to the Vet if you are not sure of the cause. Your dog could have come in contact with another animal, a rusty nail, or something that could be hazardous if it were to enter into your dog’s blood stream. Non-infected areas after being thoroughly cleaned should be covered with an antibiotic ointment, such as bacitracin. -Hair knots: Knots in your dog’s hair may simply be from lack of brushing or grooming. Dogs with undercoats are especially prone to knots in their fur. Knots that are close to the skin pull as they get tighter, causing irritation and itchiness. You can either have your dog’s fur shaved or cut to clean up the coat and remove knots. If cutting is not an option you can gently remove the knots with a slicker brush and a conditioner. Gently try to brush and work out as many knots as you can then give your dog a bath. 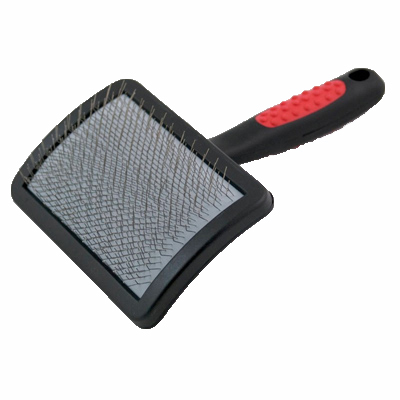 After the bath, apply plenty of dog conditioner and use the slicker brush to slide through your dog’s undercoat. This will help remove the undercoat and any knots or matting. Be sure to brush your dog regularly to maintain and healthy coat and prevent knots. -Sap: Remove sap as soon as you find it on your dog’s coat. It will get harder to remove the longer you wait. If the sap is on the edges of your dog’s fur then carefully trim it away with scissors. If trimming is not an option you can try a sap remover, olive oil, mayonnaise, or peanut butter. All of these items have a high oil content, which softens the sap and breaks down it’s stickiness. Work your item of choice into the fur/sap and let it sit for 10-15 minutes. Gently comb out the sap with a wire comb pictured to the right and give your dog a bath with warm water and shampoo to remove the rest of the sap along with the removing agent. -Foreign Object: If you find a thorn or twig in your dog’s coat then gently remove the object. If the object, such as a thorn, looks to be infected in the skin then it may be a good idea to have it removed by a professional.